I'll admit, when I heard that Ben Affleck was going to be making his directorial debut, especially with such challenging, serious material as a Dennis LeHane novel, I was skeptical. After all, this was the guy who was the subject of a widely publisized love affair with Jennifer Lopez, bringing the once promising, Oscar-winning screenwriter of Good Will Hunting down into the realm of tabloid fodder. On top of that, the last film based on a LeHane novel was Clint Eastwood's Oscar-winning Mystic River. Not having directed a feature film before, there was nothing really in Affleck's career that proved he could pull something like this off. But he has. 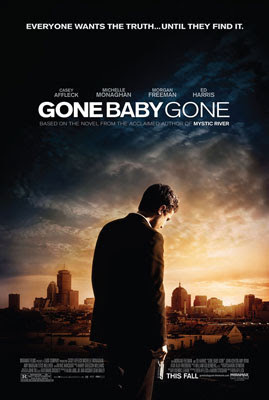 Gone Baby Gone is a taut, superbly crafted mystery about a free-lance husband and wife team of missing persons detectives (Casey Affleck and Michelle Monaghan) who are hired by a distraught aunt to augment the investigation of the kidnapping of a four year old girl from a drug-ridden home. The investigation leads them deeper than they have ever gone before, into a world of drug addicts and gangsters, and ultimately to a surprising conclusion that was nothing like they ever expected. The film falters a bit in the middle when it loses focus as it sniffs down the trail of a red-herring subplot, but Affleck's direction is always solid and the performances are top-notch. Especially Casey Affleck's (Ben's brother), who is having a banner year after his haunting turn in The Assassination of Jesse James by the Coward Robert Ford. He, along with Emile Hirsch in Into the Wild may prove to be this year's great revelations. He projects a world weariness that belies his young appearance, perfect for a character that is constantly being underestimated for looking so young. 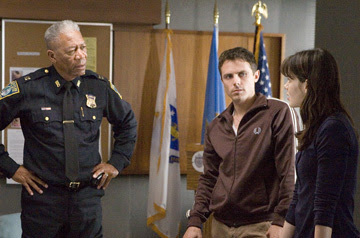 The most impressive aspect of Gone Baby Gone, however, is its startling moral ambiguity. Especially for Affleck's maiden film as a director, Gone Baby Gone is infused with a nagging moral complexity that makes it fascinating to contemplate and impossible forget. This is the kind of film that stays with you for days, that sparks immediate discussion. And it raises legitimate issues of right and wrong that stubbornly refuses to be black and white. It exists firmly in shades of gray where nothing is what it seems and no question has a right answer. And it never feels forced or contrived. Affleck navigates the gritty underworld of Boston like he has known it his whole life, and the questions stem from eerily plausible situations. By the time the film ends, we are left with a nagging sense of melancholy, our heads filled with "what ifs" and "what would I do?" That is the mark of great filmmaking, when the audience is forced to insert itself into the film and identify with the main character. Gone Baby Gone is no easy film to watch, it is a thinking man's piece that demands attention and reflection. But it is all the more rewarding for it. Ben Affleck has proven himself to be a skilled director, here's hoping this is a harbinger of great things to come. Oooooh, what a good review. I loved the film as well. I have an, um, admiration, for Casey Affleck as well. LOL.